There are many unsung heroes working in their own ways across campus to enhance and honour the student and alumni experiences here at Pearson College UWC. 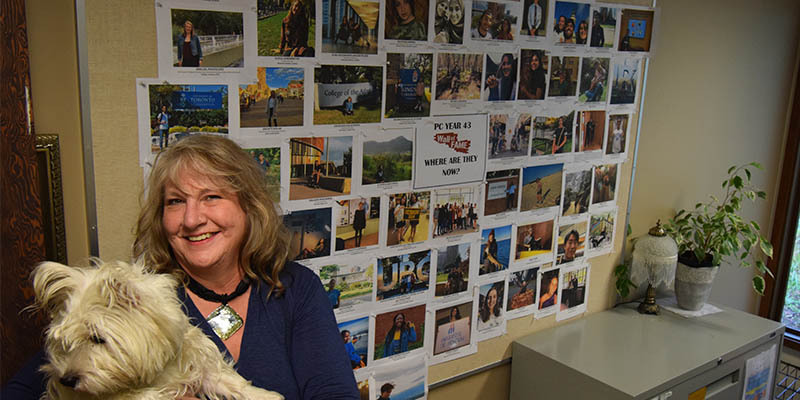 Every year, Academic Services Assistant & Student Records Coordinator Donna Grunder (and constant companion Wave, a lively and curious West Highland Terrier who keeps everyone on their toes) has literally thousands of interactions with students that are both formal and informal. Her office is a friendly and inviting clutter of homeliness and sweets that encourage students to not only relax for a moment or two but also to consider the educational and experiential trajectory of their predecessors posted proudly on Donna’s wall. Donna’s Wall of Fame project is an annual “where are they now?” effort that, at a glance, shows what every one of the most recent graduating year class is doing – ranging from attending an Ivy League school to adventuring as a kayak guide in Greenland to working with NGOs to support refugees — and everything in-between. It’s a reminder of the global ambitions and fearlessness of Pearson students…and alumni. I began the Wall of Fame as a way to keep track of the students who graduate from this school and who venture on to new academic challenges, emotional challenges working for Global Citizen or Semester at Sea or take a year off and work, so they can support themselves in the coming years at university. I can’t say the reason I began this wall; I can only think it was because, as a mother of two sons, the mother in me gets to know the students very well going through their immigration needs, ensuring they have medical coverage, and assisting the second years through the university and scholarship process. They become part of my external family. I care for each of them and am blessed that most of them stay in touch with me. I began this Wall of Fame journey in 2009 with students from Year 35, who didn’t send me too many pictures as it was a brand new concept. This past summer, Year 43 graduated and the wall is fully covered with the entire graduating class. Current second-year students, who visit my office, see where their second years ended up and current first-year students might imagine what it will be like to go to university and be on the wall of fame. It is more a wall of “hope” as the future is wide open to each and every one of them. I’m extremely proud of what these students accomplish in their two years at Pearson College UWC and, I am grateful that I was able to assist them on their journey.